"What Business Should I Start?" guides you through a unique seven step process to identifying potential businesses you could start - making certain they meet your needs, suit your personality, fit your interests and goals - and that they have a realistic chance of success. "What Business Should I Start?" guides you through a unique seven step process to identifying potential businesses you could start - making certain they meet your needs, suit your personality, fit your interests and goals - and that they have a realistic chance of success. 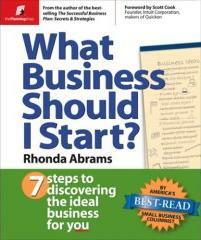 The book then provides a framework for helping you choose among those potential businesses. • You’ve been saying, "Someday, I’d like to own my own business." • One of the things stopping you from launching your own business is that you aren’t sure which business to start. • You have a few serious ideas for different businesses but don’t know how to choose one and get going. • You have absolutely no idea which business to start; you don’t know which businesses would suit you — your needs, personality and interests, financial situation and goals. • You’ve had hundreds of ideas for new businesses but need help figuring out which ones to eliminate. • You have an idea for a business but you want to make sure it’s the right one before you take the leap and make the commitment. • You’re at a turning point in your life or career and are looking for direction. • You’re about to retire and are considering starting your own business. • Friends and family keep suggesting business ideas to you, but none seem to be the right fit for you. • You’re trying to decide whether to launch a business or look for a job. Reader Raymond Capiaux says,"I am a retired executive quite mentally alert and keen on doing something useful with the rest of my life. This book is excessively stimulating in pointing out business opportunities which initially I had not considered, t is probably the book that provides the most in-depth review on the topic. I enjoyed in particular the part that matches your entrepreneurial type with the field of opportunities. This analysis is to my knowledge quite unique and was very useful to me. The info about franchising and franchises is so clearly presented that it denotes on the part of the author a clear, concise intellect. Real life data is most useful and complements a book that is essential to making an informed decision. A must buy." Reader Joshua Babbitt from New York City says,"This book is full of information that is helpful in learning about or selecting a business to start. It is broken into seven steps that help readers learn about themselves, their ideas, and a variety of small businesses that may fit with their aspirations. I found the "popular business categories" and "popular individual businesses" sections to be full of interesting and useful information including details and statistics about the business, references to places to find more information and ideas to help you in starting that type of business. There is also a section on franchises that I found interesting. I'd recommend this book to someone who is looking to start a business but needs help in sorting out their strengths and areas of interest, and to someone who is looking for a great resource of information on about different types of small businesses."